Max McGee (Super Bowl I) – technically it wasn’t a Super Bowl, it was called the AFL/NFL Championship Game in the beginning, but even in the first one ever played their was a controversial choice. 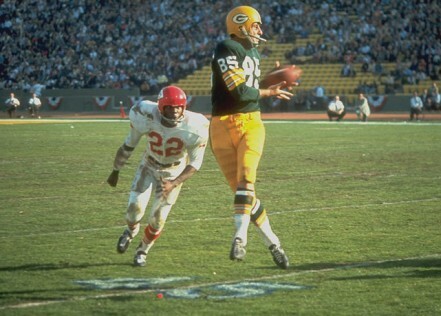 The Packers won over the Kansas City Chiefs handily, 35-10, and the team’s stellar quarterback, Bart Starr, was named MVP. Starr played brilliantly so it wasn’t a bad choice, but McGee may have been even better. He was a little-used past his prime veteran at the time and didn’t expect to play, and was hung over on game day after partying with a couple of stewardesses the night before. McGee was forced into action when Boyd Dowler separated his shoulder early in the game, and wound up catching 7 passes for 138 yards and a pair of touchdowns in the win. 2. 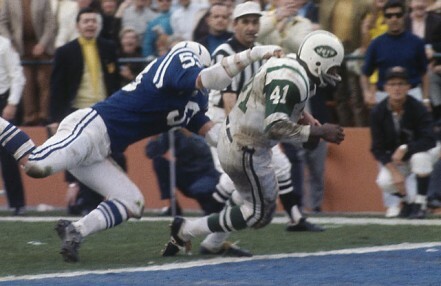 Matt Snell (Super Bowl III) – since Joe Namath had guaranteed that his New York Jets would defeat the highly-favored Baltimore Colts and then delivered on his guarantee, there was no way anyone but Broadway Joe was going to win the MVP Award in Super Bowl III. But running back Matt Snell had a strong case to be the game’s top player also. He rushed for 121 yards on 30 carries and his team’s only touchdown as the Jets ran a ball control offense to shock the Colts 16-7. 3. 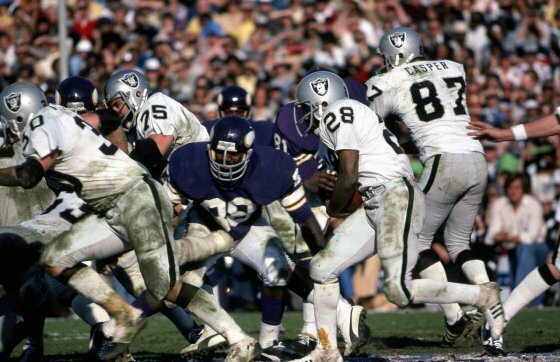 Clarence Davis (Super Bowl XI) – this Super Bowl was a shining moment for the Oakland Raider franchise as they won their first championship after being one of pro football’s most winning teams for a decade, yet failing to “win the big one”. They manhandled the Minnesota Vikings 32-14 to give coach John Madden his first title. Running back Davis could easily have been picked as the game’s MVP. He rushed for 137 yards on 16 carries as the Raiders crushed the aging Vikings with a bruising run game. It wasn’t even a case of Davis being overshadowed by a quarterback. Ken Stabler played a fine game also in leading the Oakland attack but he wasn’t chosen as MVP either. The honor went to wide receiver Fred Biletnikoff, who made a series of key receptions during the game among his 4 for 79 yards, not exactly overwhelming statistics. 4. Thurman Thomas (Super Bowl XXV) – the precedent was set in Super Bowl V, when the Colts defeated the Cowboys but Chuck Howley of the losing team was chosen as the game’s MVP. 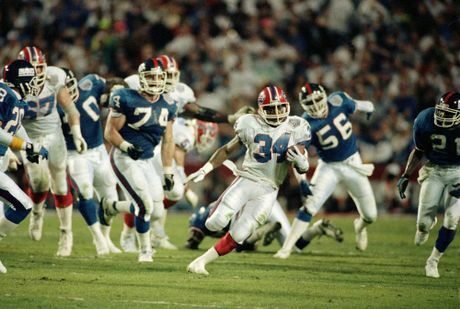 Super Bowl XXV, between the New York Giants and Buffalo Bills, was one of the most exciting ever played, and Buffalo’s Thurman Thomas, with 135 yards and a touchdown on 15 carries and another 55 yards on 5 pass receptions, was the dominant player in the game. When Scott Norwood’s last second field goal went wide right, giving the Giants a 20-19 victory, MVP voters decided that the Giants’ Ottis Anderson deserved the award instead. Giants’ coach Bill Parcells had employed a grinding rushing attack to eat up time on the clock and keep the Bills’ high-powered offense off the field, and Anderson was the main guy doing the damage, with 102 yards rushing and a TD. Still, Thomas’ performance was dynamic and one for the ages. 5. Dwight Smith (Super Bowl XXXVII) – there’s no question the MVP of this Super Bowl should have been a defensive player. For one thing, the quarterback duel was between a pair of journeymen, Oakland’s Rich Gannon and Tampa Bay’s Brad Johnson, not exactly a marquee matchup. For another, the Buccaneer defense absolutely dominated Gannon and the Raiders, forcing 6 turnovers, with 5 of them being interceptions, in a 48-21 rout. So Tampa safety Dexter Jackson, who had a pair of picks, was named MVP. Deserving, I guess, but not when you consider that his secondary mate, Smith, also had a pair of interceptions, but he returned both of his for touchdowns. The reason for the snub is that the second of Smith’s pick-sixes came with just a few seconds left in the game, when the MVP voting was likely already completed.